With nearly 30 years experience in the quality furniture business you can trust us to make your dream project become a reality and impress your friends and family too. 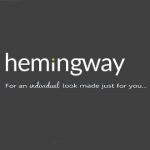 Hemingway is dedicated to supplying superior quality of product and specification. A design and product service that gives the client what they require not what is available from a generic product portfolio. We offer a clear design service with no hard sell or bogus discounts and sales, Just good old fashioned service that will make the whole experience stress free. All of our kitchens, bedrooms and furniture is fitted. With our 10 year guarantee and a significant level of repeat customers and recommendation we are employing more local craftsmen than anytime in our history. All of our products are designed and manufactured in our state of art production facility located in the English Midlands. We put together cutting edge technology and traditional craftsmanship to create projects that are unparalleled and with a realistic price tag.